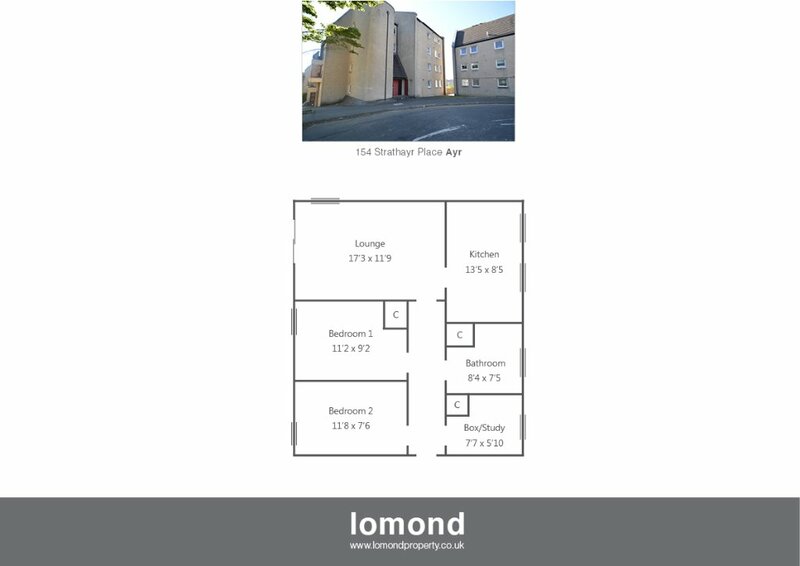 154 Strathayr Place is a first floor flat situated close to the River Ayr and is just a short walk from the town centre. The property comprises of two double bedrooms, box room, lounge, kitchen, and shower room. The property benefits from residents parking, secure door entry, double glazing and gas central heating. In summary the property layout extends to secure door entry with stairs to the upper level. The property itself comprises of an entrance hallway with large walk in cupboard/box room and two further storage cupboards off. The living room is neutral throughout with balcony off. The dining kitchen is off the living room with floor and wall mounted units. Both bedrooms are double in size. Bedroom 2 benefits further from fitted cupboard space. The shower room completes the accommodation and comes with separate shower cubicle, WC and WHB all finished to neutral tiling throughout. Externally the property has residents parking and is situated just a short walk from the River Ayr and the town centre. Strathayr Place is a residential area. Ayr town is close by and provides access to a range of amenities including supermarkets, bars, restaurants and town centre shopping. There are a number of local primary schools and secondary schools within the greater Ayr area.